In spite of its complexity, morality has been reasonably well defined, as has its evolutionary status. However, we are left with a profound question: How could something as magnificent and unique as morality evolve through blind selection processes? One rather desperate answer to this persistent philosophical question is that the evolutionary process has been focused in moral directions by some special, unknown purposive mechanism. However, it is well known that purpose and scientific evolutionary theory are like oil and water. In a recent New York Times article, Robert Wright described a conversation with William Hamilton about this. Hamilton raised the possibility of non-Deistic outside designers; he even came up with the possibility of sophisticated extraterrestrials using Planet Earth as a playground, to see what might happen if morals were made to evolve. Here I shall pose a more realistic theory, that is less far-reaching but also far less fanciful. It was Donald T. Campbell who most succinctly defined evolutionary process as being automatic and devoid of purpose. Campbell characterized its workings as “blind variation-and-selective-retention.” Ernst Mayr made the finer point that evolutionary processes may appear to be solving problems teleologically, by design or purpose, but in fact these effects are merely teleonomic, appearing purposeful through the course of evolution but being entirely mechanical. It is teleonomy that explains the beaks on Darwin’s finches. Evolutionary theory’s two big taboos have been against group selection thinking, which after half a century of interdiction (and then extensive, zealous debate) is now alive and well, and against bringing anything suggestive of teleology into natural selection theory. The former approach has had no more eloquent advocate than David Sloan Wilson. Moral evolution poses many mysteries, including how we came to blush with shame. It is at such a juncture that we wonder whether some higher purpose has been imposed upon the evolution of our species as a matter of conscious design, and in that spirit I take on the role of what Wright calls “purpose ponderers,” scholars who have looked to discover some broader ultimate purpose perhaps inherent in cosmology, or to uncover the possibility we are simply living within some kind of simulation. As with playful extraterrestrials, neither approach seems to have a “provability” advantage over a simple belief in a rational, omnipotent God, but here I propose a kind of purpose that could reside inside of, and not outside of, evolutionary process. This might offer a new pathway for discussion. The idea of purposeful elements in the natural selection process has barely been on the scientific radar, although evolutionary scholars like Donald T. Campbell, William Durham, Charles Lumsden and E. O. Wilson have mentioned “rational preselection” as a possibility. The idea of rational preselection stems from the fact that humans understand death and can conceptualize larger subsistence outcomes that affect their reproductive success. Thus, they sometimes can purposely anticipate and avoid untoward short-term outcomes that would seriously impair their fitness, and thereby enhance their overall evolutionary chances. These purposes are normal ones, expressed in the strategies of intelligent, problem-solving human beings, and the question is whether these people may actually be helping to shape the direction of natural selection processes. As far as self-conscious genetic engineering is concerned, the answer is no, for before the advent of such engineering (including eugenics) evolutionary actors had no inkling that they were embedded in a genome. However, if people were making immediate rational decisions that unknowingly affected their reproductive success in parallel directions, this could add to the discussion. One effective way to modify a genome is to start killing people. The egalitarianism of mobile hunter-gatherers is well-known; less well-known is the fact that to remain egalitarian, these groups must sometimes resort to capital punishment to prevent ambitious group members from becoming tyrants. In a sample of sixty-five Pleistocene-appropriate hunter-gatherers taken from all six world regions where hunter-gatherers have been studied, nearly half of the researchers cited instances of capital punishment of bullies in spite of spotty ethnographic reporting. Over evolutionary time we may assume purposeful, well-strategized capital punishment to have been a widespread and consistent practice, and also that inevitably the human genome was affected. Every time another bully was dispatched in the here and now, the genes that supported bullying were being further diminished in the gene pool. The predictable result would have been a lessening of bullying tendencies in the species—a profound effect that was at least partly shaped by human intentions. These collective intentions were immediate: to remain egalitarian, these groups had to kill serious bullies. It was an unintended long-term consequence that genetic tendencies to bully were being reduced in a similar fashion, and such parallel effects can be seen as introducing a rather immediate element of teleology into the natural selection process, from within. Human preferences may also have shaped our evolution in “positive” ways. For instance, Richard D. Alexander’s potent theory of indirect reciprocity looks to selection-by-reputation as a basis for altruism: While altruistic acts taken by themselves are individually maladaptive, they can result in good social reputations that pay off in fitness and thereby more than compensate the altruistic losses. Here the selection process is subtler than with group capital punishment for it is not the entire group punishing antisocial dominators, but rather a pattern of individual decisions that favors altruists as partners. The net result for natural selection is similar. Purposeful decisions enhanced altruistic tendencies, just as they reduced bullying and helped to domesticate us as a species. In effect, a highly-predictable pattern of immediate, effective, and purposeful decision-making was having parallel evolutionary effects, in a direction guided by evolved moral values. On this basis we may ask not only how evolution helps us to explain morality, but also how morality can help us to explain evolution. Collective intentions to punish are easier to read than those of individuals choosing partners. To mobilize a small group to take such dire steps requires group agreement; otherwise there will be differences of opinion that lead to strife. For that reason, in Moral Origins I emphasized consensus seeking as being essential to moralistic social control by local groups. In A Natural History of Morality, psychologist Michael Tomasello has emphasized “shared intentionality” in moral evolution, a concept borrowed from philosopher John Searle. This dovetails nicely with the emphasis on consensus processes, but Tomasello has denied apes the capacity for such collective intentions. Primatological sources indicate that both chimpanzees (at several field sites) and bonobos (at one so far) have engaged in concerted gang-attacks on ranking males, which are reminiscent of the human attacks against bullies covered above. One possible implication, which should add to the discussion, is that the impact of collective decisions on evolutionary process may not be totally exclusive to our own moral species. Boehm, C. (1978). Rational Pre-Selection from Hamadryas to Homo sapiens: The Place of Decisions in Adaptive Process. American Anthropologist, 80: 265-296. I thank Jeff Schloss for commenting on a draft of this essay. Chagall, Marc. 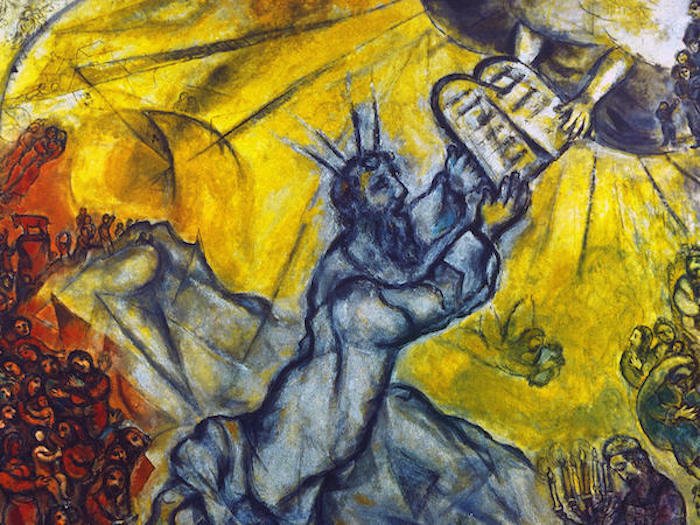 "Moses receiving the tablets of the law." 1966. Oil, canvas. Christopher Boehm is Professor of Biological Sciences and Anthropology and Director of the Goodall Research Center at University of Southern California. Can Evolution Have a ‘Higher Purpose’?